We all have those friends… the ones we’ve known since childhood. We went to school with them, hung out in each others family rooms, their parents always seemed to be cool with adding another plate to the table so you could stay for dinner, and your parents always drove you all to the movies. In fact, you probably find it really hard not to still call their parents “Mr & Mrs” no matter how many times they’ve told you that you can call them by their first name now. We grow up, move on and build adult lives – making friends with people at work or through common interests other than just going to school together. But still… those friends from way back… they hold a special place – they know your history (sordid or not! ), where you come from, and why you are how you are in a way new friends never can. They’re always there for you in the lousy patches and they’re the ones who celebrate the big and small things with you! So that brings me to Donny Vegas and Blondie. They pop up here every now and then. They helped me taste test cheese, try out a cookbook and Blondie makes spectacular cakes that I love to photograph. I’ve known them both since I was about 9. And then somehow, when we were 16, they hooked up and many years, two kids, two dogs, several cars, a couple of different cities and a few homes later, they’re still hanging out. Donny is my bartender. He’s been making me martinis for years – he’s just really good at it. He likes mixing things. And he loves his beer – in fact, he had a beer advent calendar this past December that he showcased on his Facebook feed. So when Samuel Adams asked me if I’d like to work with them I knew exactly what I wanted to do and who I wanted to do it with! Beer Cocktails with the Vegases! Who better do this with than your oldest friends? It took some arm twisting (for like, 0.00000025 of a second) but they were on board. We had a fully stocked liquor cabinet, a solid supply of Samuel Adams Boston Lager, mixers, and cheese and crackers. Oh, and Doritos. The sweet chilli kind. You know that’s going to make for a solid evening. We had three ideas we wanted to try out. A Boston Caesar (we’re Canadian after all! 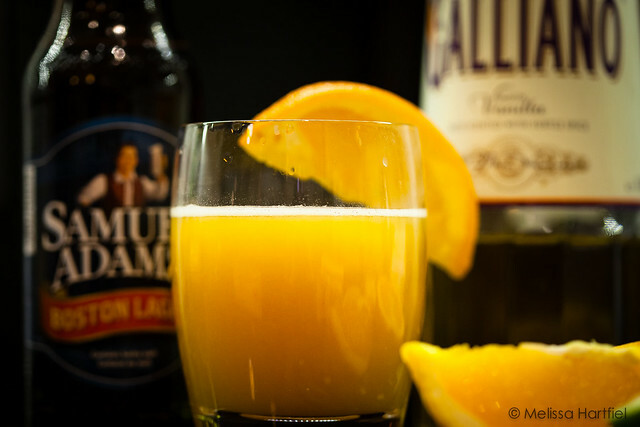 ), a twist on the Harvey Wallbanger and, we wanted to do something with tea and beer. First up was the Boston Caesar. This one turned out nicely – vodka, Clamato, Sam Adams, Tabasco, Worcestershire Sauce, some peppery Caesar salt to rim the glasses and a slice of lime. But we thought we could do better. Donny has a very tall bottle of Galliano on his built in sideboard in the dining room – in fact, the built in was created with shelf space specifically tall enough to accommodate the Galliano. 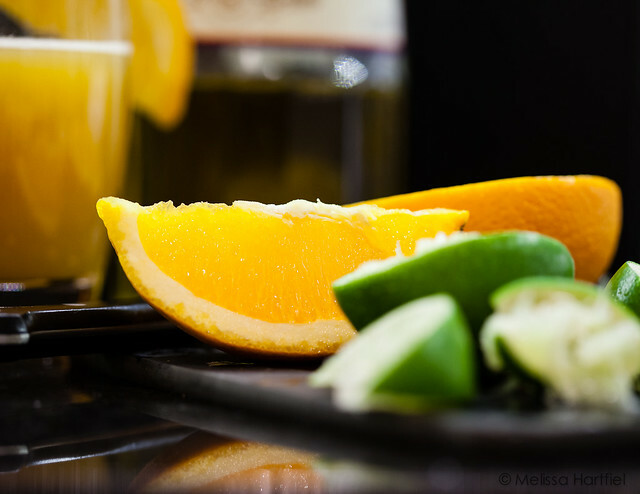 That and the fact that we had a ton of citrus fruit to use, meant that a Harvey Wallbanger came to mind! 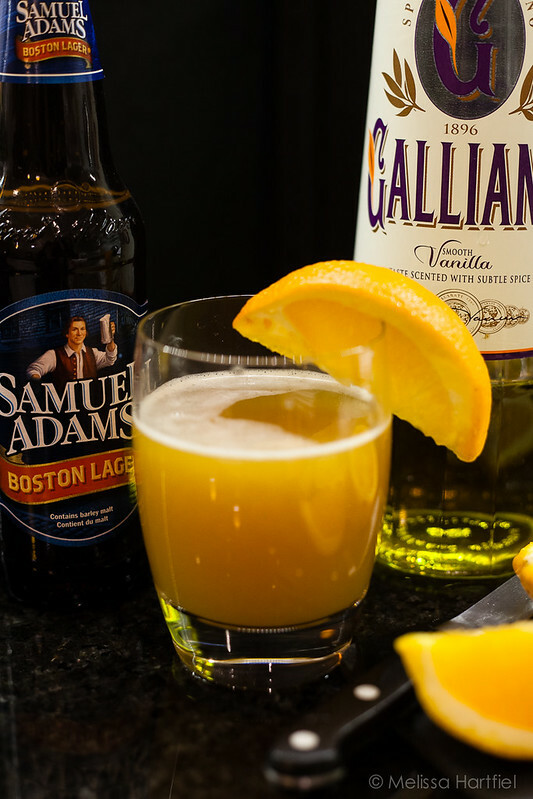 So that’s what we did – Galliano, orange juice and Sam Adams. It was a fizzy creamsicle! We loved this one. All three of us. We did a little test batch and decided it was so good, we’d make full ones and they went down very nicely! It was while we were making the Wallbanger that Don was telling us about his last trip to Boston where he stopped at a pub for a beer (which, being in Boston, was of course, a Sam Adams), only to discover that Sam Adams was buried in the cemetery across the street! Next we really wanted to try beer and tea – this is something that’s popping up a lot lately. Blondie and I are big tea drinkers so she brewed us up a pot of black tea early in the evening so it could cool while we worked on the other drinks. We mixed the beer and tea together – trying for a sort of iced tea. Meh. We weren’t digging it. It needed something. So Donny went back to the cupboard and pulled out my personal weakness – Chambourd. Years ago I used to manage a drug store for a national chain. I was single handedly responsible for the spike in raspberry iced tea sales in that store. My sales rep for the large soda company who made the stuff knew it had better be in stock if he wanted to keep me happy! So what better than trying to make a raspberry version of a iced tea beer? It was pretty good. I would make it again. In fact, I have Chambourd in my cupboard right now… but, the Boston Wallbanger was still the favourite. We made another round of those around 1am to photograph, and then of course, we had to drink them (for which I am very grateful I had my tripod with me – testing cocktails has some side effects!). 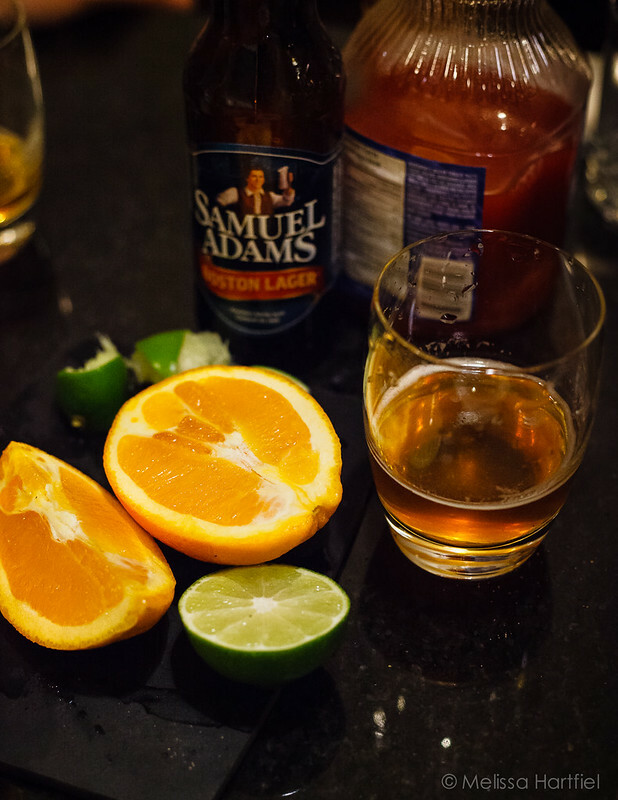 And so there you have it – our official Sam Adams beer cocktail: the Boston Wallbanger, or alternatively as a friend on Instagram called it, the Harvey Wallbeerger! **Disclosure Notice: I was financially compensated and provided with product for the purposes of writing this post but all opinions are my own. But you all know I wouldn’t work with a product I don’t love, right? **A fair amount of alcohol was consumed while we tested cocktails. For those of you wondering, there was no driving afterwards. I spent the night on the Vegases comfy couch. If you’re going to drink, be responsible and leave the keys behind. You just gotta love of guy (and his wife) who creates a built in to house his bottle of Galliano! The Vegases sound like a lovely couple and a wonderful pair of friends for you. The Boston Wallbanger looks great and *side effects* from having one or two or not, the photos are great! Cheers to this inventive cocktail and to long, fabulous friendships! Mother of pearl. I’LL NEVER GET ANYTHING DONE AGAIN. 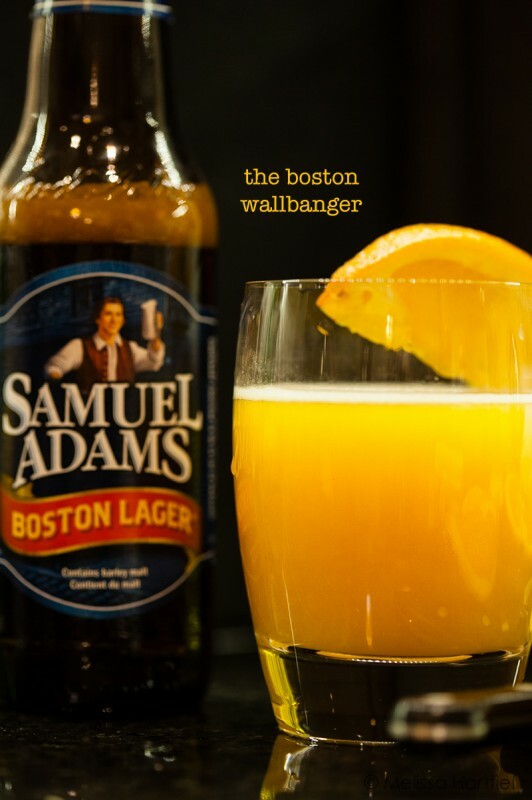 The Boston Wallbanger sounds delicious. I’d drink that. Plus, I don’t think you can wrong making a drink that is called “Wallbanger”. Makes me laugh every time ’cause I’m so mature! I recently started noticing more beer-cocktails on menus, and I’ve loving them so far. I’d be down with the Caesar one or the wallbanger. haha.. wallbanger.